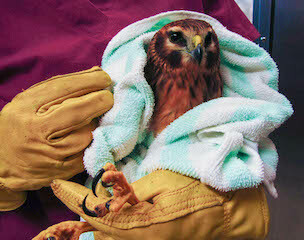 A patient we rarely see at the #CROWClinic, this northern harrier was admitted after it was found seemingly disoriented. An intake exam found the harrier to be anemic with generalized weakness and dehydration. It is currently receiving fluid therapy and plenty of mice. Northern Harriers are a hawk species that relies on hearing as well as vision to capture prey. The disk-shaped face looks and functions much like an owl’s, with stiff facial feathers helping to direct sound to the ears. The northern harrier was released in Fort Myers near where it was rescued.